Will Star Wars 9 Retcon Rey's Parents as Something More Than Trash? Rian Johnson really pulled the rug out from underneath fans when he revealed that Rey's parents are nothing more than garbage people who like to get drunk and flit about the galaxy like a couple of reprobates who'd really give Mickey and Mallory Knox a run for their money. But was it all a lie told by Kylo Ren? Word on the streets is that Star Wars 9 director J.J. Abrams is going to retcon the so-called mess Johnson made by giving Rey a mom and dad that really matter. But is it too little, too late? Despite a minority of Star Wars fans clinging to the idea that The Last Jedi was actually good, the hate for Rian Johnson's second installment in The Force Awakens trilogy continues to grow. And right now, a lot of fans seem bored and disinterested with whatever J.J. Abrams has planned. if that's the case, whatever happens in Star Wars 9 could be met with a shrug and a sigh. So why even try, right? Well, apparently J.J. Abrams isn't giving up on Lucasfilm's most viable franchise. And he plans to make Star Wars 9 something special for fans of all ages and generations. And part of that, if rumor serves correct, is giving Rey the mom and dad she was always meant to have. 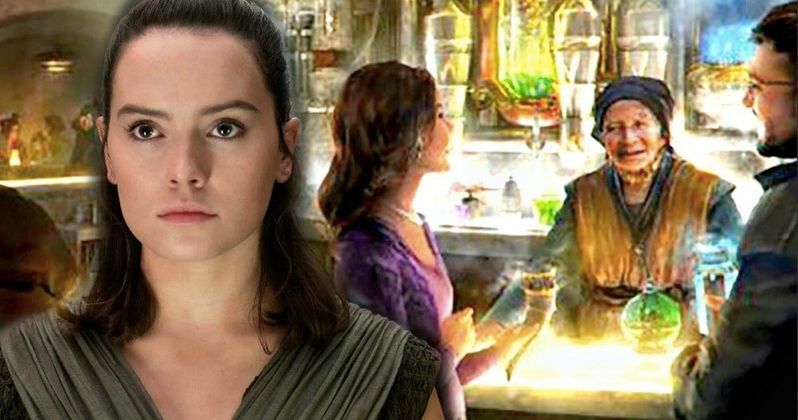 Apparently, if we're to believe some leaked Star Wars 9 storyboards, Rey's parents will reveal themselves to the young Jedi when she visits a new Jungle planet. We've seen this jungle planet already in leaked set photos. Some believe it is the planet of Batuu, which is the same planet that makes up the Star Wars: Galaxy's Edge theme attraction at Disneyland. Others believe that the planet is Yavin 4, the Jungle-covered rock first witnessed in A New Hope and revisited in Rogue One. This latest leak comes from The Daily Express, who claim to have seen this storyboard, depicting a meeting between Rey and her mom and dad. The painted image in question shows Rey from behind, her lightsaber drawn and ignited. She is surrounded by a Jungle-like environment. Before her stands two glowing figures. One is a man, and the other is a women, if we are so bold as to assume their gender. They glow white, holding hands. It is believed that these are Rey's parents. Are they dead? Are they Force Ghosts? What exactly is J.J. Abram pulling here? Many believe the subject surrounding Rey's parents is closed. Some on the Lucasfilm team have claimed that Kylo Ren didn't lie to Rey. Her parents really are nobodies who sold her off for drinking money. But, as we've seen other pieces of Star Wars lore get retconned, this could all be from a 'certain point of view'. The thought is still, as it was before The Last Jedi hit theaters, that one of Rey's parents either carry Skywalker or Kenobi blood. Wouldn't it be a kicker if Luke and Leia actually had a brother or sister that we didn't learn about, and that these force siblings are triplets? Could happen. Normally, a Force Ghost glows blue, so why, if these are Rey's Jedi parents and they are dead, do they glow white? That's a question that needs to be considered. Is this a vision, or a message being sent to Rey? It's all too impossible to even guess what is really going on here without more concrete evidence. But just because a pie tastes bad hasn't stopped a lot of pie cows from eating it before. Perhaps these questions will get answered when Star Wars 9 hits theaters December 2019. Perhaps they won't. Director J.J. Abrams is looking to put a big pretty bow on this entire Skywalker saga. Will that include giving Rey genuine parents who mean something in the scheme of this new trilogy? Who knows?